This challenge was not a vegan friendly one. In fact, the hostess pretty much said, Vegans, I don’t know what to tell you. 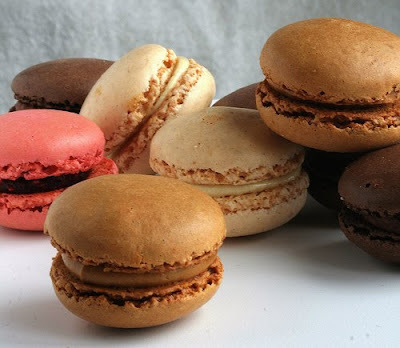 Unlike American macaroons, French macarons are basically meringue sandwich cookies. Now I did previously have success making egg replacer meringue, but that was folded into a cake batter. This time I would need to fold almond flour into the meringue and bake it. Instead of agonizing over forming a perfect replica in vegan form, I decided to just have fun with my vegan interpretation. I made meringue and tinted it orange. These will be Halloween cookies. It freaks me out to use too much food coloring, so my orange is rather pale. Rather than grind a whole cup of expensive raw almonds into flour, I used 1/3 cup ground almonds, 1/3 cup ground peanuts, and 1/3 cup ground…. I folded the flour mixture into the meringue and piped the batter onto baking sheets and baked as directed. I have never eaten macarons so I’m not sure these are the proper texture. I can tell you that I ended up calling them *pillows* because they were super fluffy and soft with a slightly crisp edge. Knowing I could not create anything remotely equal to those gorgeous cookies, I grabbed a few chocolate chips and created these little monster treats. They are gluten free, tasted good, and were fun to bake, and they're spooky, right? So I count this challenge as a success. Also, please see Hannah’s perfectly successful vegan macarons – amazing! hahaha! so cute! I've never had a macaron either so I could not perfectly re-create it. Well I didn't have a clue either how to make them... Those little monsters are gorgeous though! Wow. I'm impressed. They do kind of look like scary little clams with eyes but they sound delicious. I agree with you about food coloring - I'd be afraid to eat the real macarons but I'd definitely eat your version! I think yours turned out great, the texture looks dead on. As long as they taste good, who cares? You did much better than me- I opted out of this challenge, lol. Can you win a prize for most creative interpretation of a dish? If so, you should win on this one. And I guess some things just cannot be veganized. But still cute. I love macaroons. I am continually impressed by your "daring-ness." i absolutely love the approach you took, Diann! i hear ya on the food coloring – it kinda weirds me out a bit, too. the texture sounds awesome and i love that you created the most delicious of pb filling. mmmmmmmmm! what a fun challenge and your results rock! such a tasty gluten-free success. yay! ha! i love that everyone has spooktacular treats on their blogs right now! cute! i think yours are way cuter! Would you be willing to share your recipe? I love your macaroons and I agree with Hannah. Yours are something very special and they look adorable. These look so light and airy. Great work!